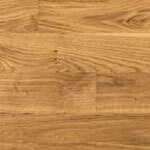 The heartwood and sapwood of white oak are similar in appearance, which can have a white to cream to light brown color. The grain of white oak tends to have longer rays than red oak. These distinctive rays are what make white oak so prized for construction of “Mission” style furniture and woodwork. Depending on whether the wood is plainsawn, riftsawn, or quartersawn, the grain of both red and white oak can have a plumed or flared appearance, a lighter grain pattern with low figuring, or a “flake” pattern that is referred to as “tiger rays” or “butterflies.” White oak shows much less variation than red oak. White oak has a ranking of 1360 (compared to that of red oak, which is 1290). Both red and white oak have good resistance to splitting and excellent holding ability. White oak has better machining qualities than red oak. 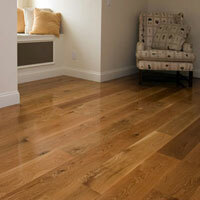 White oak can turn green or brown when the surface comes in contact with bleach or water-based finishes.